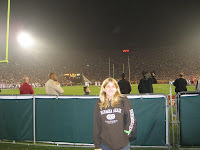 On Saturday my friend Laura and I went to the USC homecoming football game vs. Oregon State. 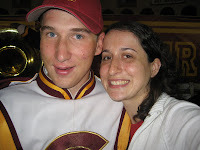 Her younger brother plays the trombone in the marching band and hooked us up with tickets while she was visiting from NY. 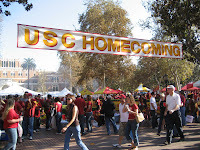 It was my first time on the campus and unlike the UCONN homecoming that I went to a few years ago, where the tailgating took place in the stadium parking lots, the partying at USC took place on every inch of grass on the campus. It was a sea of red and gold with tents stacked with beer and BBQ, yet I still managed to run into two friends by accident, which was awesome. The marching band even plays through the courtyard with a police guard on bikes and Segways. 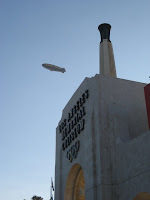 The USC stadium is also the Los Angeles Memorial Coliseum, which was built for the 1932 and 1984 Olympic games. At the end of the third quarter they light the same Olympic torch. The torch is ignited by a flip of a switch located in the scoreboard control room adjacent to the press box. 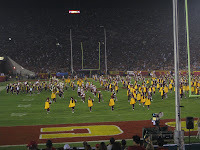 Given the fact that the stadium seats 90,000 people, I figured we'd be up in the nose bleed seats, however we were right on the field with the band. 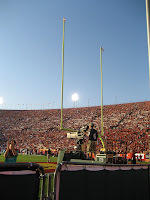 Right behind the goal post. 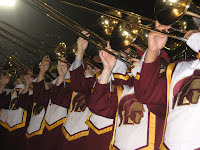 The massive marching band meanwhile was very impressive in their trojan costumes complete with hats and capes. I can't play an instrument never mind march in varied formations and dance.